Christian returns in Loviatar No. 7 with an entire issue dedicated to my game of choice, B/X D&D. It features Hex 003, the home of the halfling village of Combe, some goblin caves, and lots of basilisks. Let’s talk about the basilisks first. Basilisks continue a theme from earlier hexes (which used the catoblepas): deadly petrifying monsters. It’s an interesting choice, especially for a hexcrawl aimed at low level characters. Monte Cook even recently used fighting basilisks as an example of mid-level play. Clearly, these monsters are not meant to be slain, at least not directly. I am often wary about making fantastic monsters mundane inhabitants of the environment. I know that Gygaxian Naturalism and monster ecology have a long history in the game, and are often considered the hallmark of a well-designed setting (i.e., a setting that “makes sense”), but I think this logic often comes at the cost of a sense of wonder. I have come to appreciate mythic underworlds and mythic geographies, though clearly there is a place for all kinds of campaigns (contrary examples include the subdued science fantasy of Dwimmermount and the many excellent gonzo settings). The Haldane Hexcrawl fits neither of those exceptions though, so why does it work? I do think it works, and it works because the naturalized monsters seem to exist outside of PC adventures. They give a strong sense of place to the world. The small gods theme from issue 6 also continues with the Stone Man, an elemental spirit and protector of the village of Combe. As I said before, I’m digging the kami vibe and definitely plan to work with some similar ideas in my own setting. That being said, we are treated to some organized religion in this issue with the introduction of the deity Elyswen the Merciful and a sisterhood of clerics that serve her, though there is not much detail yet. As before, there continue to be connections to events, locations, and people in previous hexes. There’s probably still not enough content here to run a moderately restless group on, as a party that does not take a deep interest in various elements could blow past them into uncharted hexes pretty quickly (an unencumbered human in B/X can chew through four hexes in a single day of dedicated travel). But this is a minor point, and I’m sure Christian will continue to add content in future issues of Loviatar. Another thing that I really like about the Haldane Hexcrawl is that though it has a clear identity, it is also recognizably D&D, especially if you zoom in and look closely at any given element. Many settings develop their uniqueness by taking the common atoms of D&D and tweaking them. Some examples: Dragonlance replaces halflings with kender. Dark Sun wizards drain energy from the natural environment to power their spells (and this is why the world is mostly desert). Christian doesn’t take this approach. The goblins in the caves are rather generic. So are the halflings (though Sheriff Kemper bucks this stereotype to some degree). Most elements are like this. 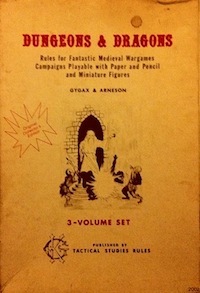 I think that there is a strong argument to be made that this approach is often superior for tabletop gaming, because players do not need to absorb a tome of setting info (or the canon of a series of novels) before playing, they just need to be relatively familiar with the common D&D tropes. And this doesn’t mean that the setting is bland. The uniqueness of the setting becomes clear through play and arises from the interaction of the elements, not their individual nature. This entry was posted in Uncategorized on March 11, 2012 by Necropraxis.